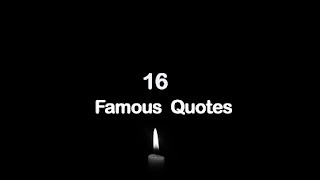 16 Famous English Quotes who change your life. 1 Self Praise is no recommendation. 3 Time once passed can not be recalled. 4 The nearer the church,the father for god. 6 Many a little, make a mickle. 7 Misfortunes never come alone. 8 Nothing succeeds like success. 9 Never put off till tomorrow what you can do today. 10 Out of sight,out of mind. 11 A drowning man catches at a straw. 12 A friend a need is a friend indeed. 13 Prevention is better than cure. 14 Pride hath a fall. 15 All is well that ends well. 16 Empty vessels make much noise. Click on this link for more quotes. Friends, if you like this quotes then Please don't forget to share with family member and friend. or if you like this post please comments i wait for your answer. Hi Sukhwinder, really nice quotes you have written in this post. I am an admin and owner of http://www.WittyWinks.com website and we need freelancer for this project. Initially we will not pay but later we will pay to all the contributor of this site. Do you want to join as freelancer? Thanks Mohinder ji .......आप ​क्या लिखवाना च​हाते है ?